(Cleveland)- National Weather Service forecasters say there is a possibility for severe storms in our area Sunday afternoon. 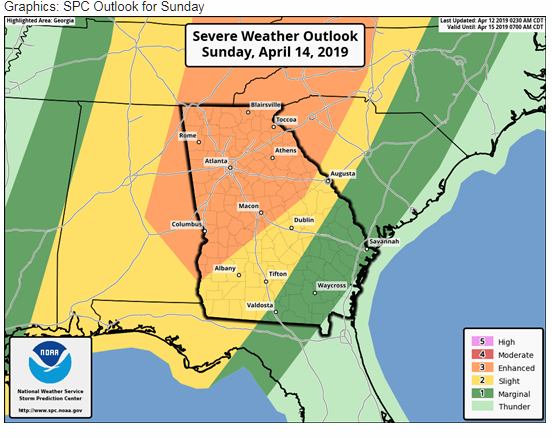 The latest word from forecasters is that the Storm Prediction Center has raised the risk of severe thunderstorms for north Georgia to ENHANCED. According to the weather service Isolated to scattered severe thunderstorms possible with the main threats being… Damaging wind, Large Hail and Isolated tornadoes possible. A band of showers and thunderstorms will enter the western parts of north and central Georgia Sunday morning and move into the eastern parts by late Sunday morning and afternoon.